Cheese…something about the sound of it feels like a slow sigh of pleasure. Cheeese – you can’t not smile when you say it. And how many different kinds of cheesey pleasures are there? What do you love? How does it inspire you? Inspiration can be found anywhere and everywhere and sometimes it comes to us when it’s least expected. At Fisher Group, LLC., this cold, winter weather and the thought of Valentine’s Day just around the corner has us thinking about what we love, how it inspires us, warm cozy spaces, and comfort food. Many of us look for inspiration from nature. Others look to fashion. What about food? 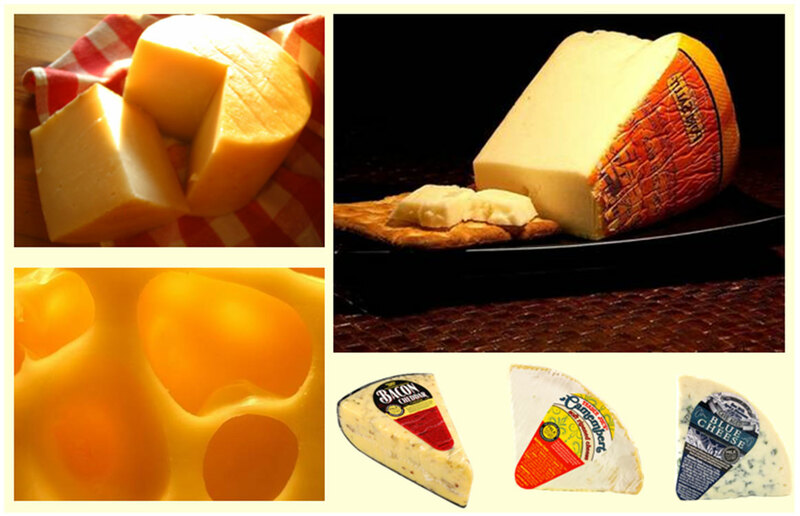 Take cheese for example, it comes in a variety of colors, finishes, and textures. Some cheeses have lots of character, others a little. Some cheeses have holes with great depth and architectural detail, like the Swiss in the image below. Many of these same elements also happen to be basic principles to consider for good design. Color, finish, texture, structural integrity, function, and style are all important factors to consider when designing a space. Fisher Group incorporates these principles into the design process for every project, whether it’s a kitchen remodel, a bathroom renovation or an addition. The beautiful curviniliar lines in the swiss cheese and irregular texture are evident in the Cylinder “Rock Candy” pendants lights by LBG. 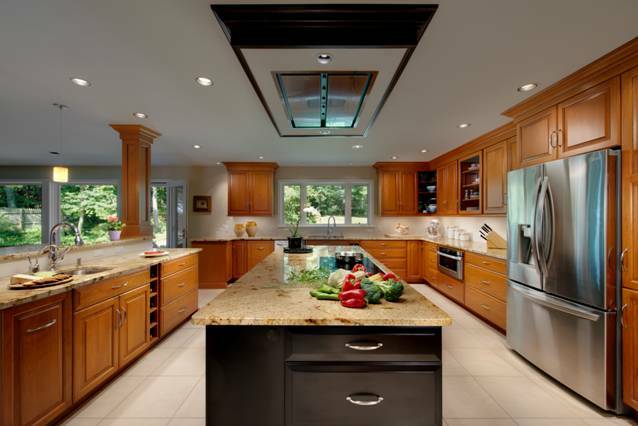 These beautiful pendants add warmth, a decorative touch, and ambient lighting to this newly remodeled kitchen. The color compliments the cork flooring, natural Alder cabinets, and Carioca Gold granite countertop. Perhaps the Poets have been silent about the subject of cheese because they’re struck speechless by it? Imagine the last time you enjoyed a really good bite of cheese. Did the noise and distractions around you blur and become quiet as your senses focused in on the utter delight of the rich, creamy goodness that consumed your tastebuds? Like a delicious bite of cheese, good design can tickle the senses with such pleasure and delight that, for a moment, one is left speechless and in awe. 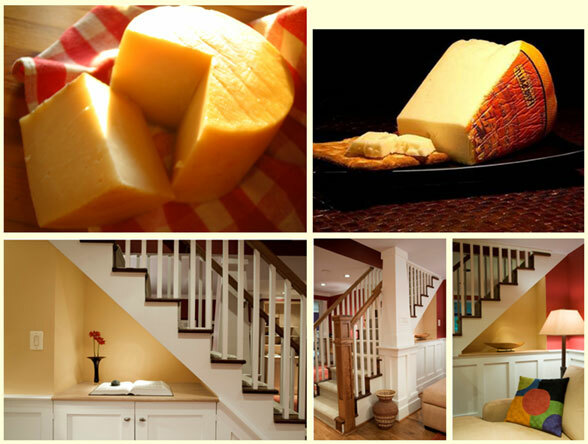 A sharp cheddar is known for having exactly that, a sharp or acidic taste that is also creamy and smooth. Combine that with bacon, a cured meat that is known for it’s rich, savory, crunchy qualities and you get quite the contrast of flavors! The two together are like a taste of heaven. Great contrast can also be used to create a great space. 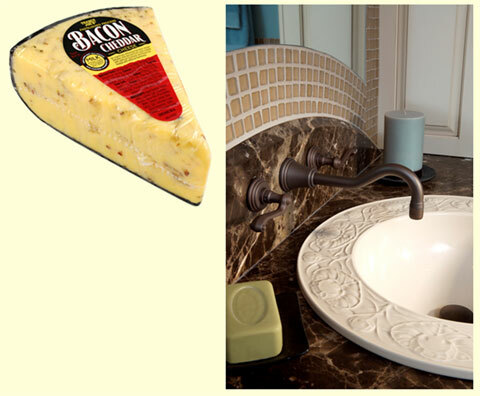 Take this sink, countertop and backsplash, for example. From the Normandy region of France comes one of the world’s richest and creamiest cheeses, Camembert. It has been described as, “as good as it gets.” The taste is succulent, ripe, rich and creamy with a slight hint of apple. While not usually associated with interior design or construction, one can find materials that fit this very same description. Take these cabinets for example. Made by Corsi Cabinets, a luxurious custom cabinet company, these cabinets have a polyester ivory finish making them smooth, glossy, rich and creamy in feel. Blue cheese comes in a variety of ways. Some are spotted, others veined. They all tend to share one commonality, a strong aroma. In general, blue cheese is described as being sharp and salty. While on it’s own, one may not describe the blue paint in this master bathroom as a sharp color, in contrast to the creamy, white cabinets and mocha detailing, it definitely adds a bit of flavor to the space. Cheese is to love, no matter what kind of a space you have to serve it in. Even if you have a party before you remodel your kitchen – though of course it’s easier to have friends over after you make the space more open! But if you’re not remodeling right now, see this website for cooking in a tiny kitchen. 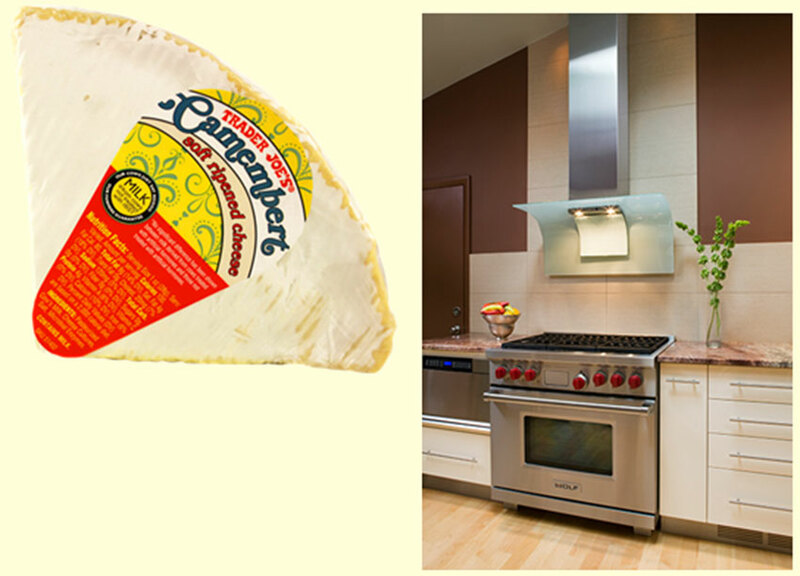 No matter your preference, there is a cheese that will fit the style of any kitchen. Just like interior design, the possibilties are limitless. What do you love? How does it inspire you? How do you incorporate your inspiration into your everyday life?